Didius Julianus belonged to a prominent family of Mediolanum (Milan) and had a long and distinguished public career. He happened to be in Rome at the time of the brief reign and murder of Pertinax, and being notorious amasser of wealth, decided to buy the imperial office for himself. It was the moment of ultimate disgrace of the Empire, for as soon as Didius Julianus made his bid to the soldiers who had just did in Pertinax, it was matched by a rival candidate, Sulpicianus, the city prefect. After a series of competing offers, Julianus won, outbidding the prefect with the sum of five thousand sestercii per soldier more that Sulpicianus was able to offer. The Senate ratified the choice under the watchful presence of a contingent of praetorians. The undignified manner in which he got the throne aroused the hostility of the Romans, who hurled insults upon the new Emperor on the very day he took the purple. The provincial generals followed suit. 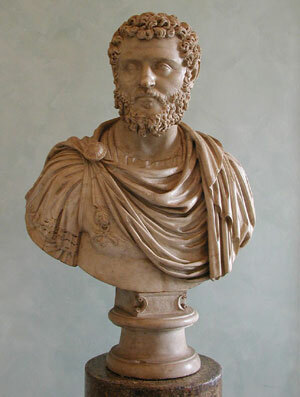 Didius Julianus tried to fortify Rome and turn into an armed camp, but the walls did not help. The principal threat came from Severus, who set out from Dalmatia in early August and penetrated deep into Italy practically without resistance. To stave off a violent confrontation in the city the Senate then deposed Julianus and when he sought to barricade himself in the palace, introduced a soldier, who on June 1 murdered the hapless emperor. List all Didius Julianus coins in the Catalog.